Bright ideas: Get on my lawn! In choosing the features for our front yard, I placed a priority on providing a wide range of activity options both to keep individual people coming back, and also to engage all members of groups who might stop by, from adults to teenagers to tweens to young children to babies. 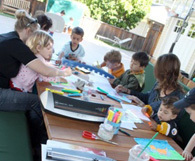 A seating area: A picnic table and benches provide a central gathering space, where families can picnic, adults can chit-chat, and kids can do arts and crafts. 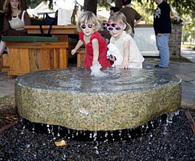 Sand and water elements: A fountain and sandbox attract younger kids who can occupy themselves for hours as they engage in child-directed imaginative play. Concrete driveway: Mike actually tore out his driveway’s aesthetically pleasing "pavers" and laid concrete instead. Some people called him crazy, but he wanted a smooth surface where kids could skateboard and draw with sidewalk chalk. A basketball hoop helps keep the teenagers and tweens engaged as the younger kids romp in the sand. If you build it, will they come? In Mike’s case, the answer is a resounding yes. His front yard has become the social hub of his neighborhood, where kids and families flock to while away sunny (and not-so-sunny) afternoons. 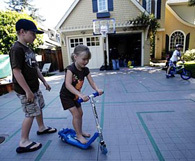 Get more ideas and tips for transforming your front yard into a neighborhood hang-out spot on Playborhood.com. Hear it from the man himself! Learn how Mike encourages neighborhood play in our upcoming webinar, “Neighborhood Play, Everyday.” Join him as he explains the decline in neighborhood play, describes some inspiring neighborhoods that have vibrant play cultures, and provides a detailed set of recommendations for parents. Register now!